Improving Delivery at Galliker’s Dairy: How AFS’ new Android-based Mobile DSD Application improved the business workflow and brought management closer to the field. Galliker’s Dairy relationship with AFS Technologies is a testament to what a true technology partnership can offer. When Galliker’s first adopted a DSD Mobile (Direct Store Delivery) solution, it was from Ross Computer Systems, which later became a part of AFS Technologies. This DSD solution helped Galliker’s run their business, and overall, they have been happy with the results. But the challenge in the technology world is exacerbated by the speed at which devices and operating system software evolve. When it was clear that support for Windows CE-based Mobile devices would be phased out, Galliker’s turned once again to AFS, to help guide them in understanding the next generation and the benefits it offered. Galliker’s Dairy was founded in 1914 when Louis Galliker purchased the Shreve Ice Cream Company, located in Johnstown, Pennsylvania. It was originally known as Galliker Ice Cream Company and has been family-owned and -operated ever since. Their well-known products include milk, ice cream, iced teas, fruit juices, and mixes. 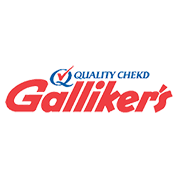 Galliker’s Dairy distributes into seven different states, with their headquarters in Pennsylvania and another facility in Cumberland, Maryland. An additional benefit was the simplified user interface, based on the Google material design standard, which streamlined the application and enhanced ease of use — helping bring new drivers up to speed even more quickly than before. The combination of new-generation devices and application features leveraging this technology helped users and management achieve their objectives. The Galliker Dairy Company is a third-generation, family-owned regional dairy company headquartered in Johnstown, Pennsylvania, since 1914. They have been committed to bringing your family the freshest and most nutritious dairy products, iced teas, ice creams and fruit juices for nearly a century. Visit www.gallikers.com to learn more. AFS Technologies (AFS) is the leading provider of software solutions purpose-built for consumer goods companies. We are committed to generating improved outcomes at the point of purchase coupled with generating efficiencies in trade spend, retail execution and supply chain. With experience developed over its 33-year history, AFS serves more than 1,200 customers of all sizes in more than 50 countries around the world. The AFS products are innovative, configurable solutions that are proven to optimize your potential with automated processes, improved productivity and rapid time to value. Visit www.afsi.com or the DSD microsite http://dsdsc.afsi.com to learn more.